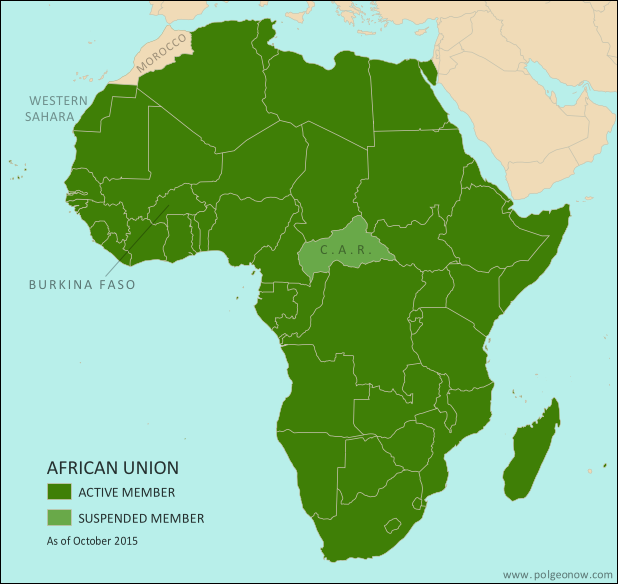 Compared to the neighboring European Union (EU), the AU is only a loose forum for cooperation between its member countries. AU members do not have an integrated economic system, union-wide laws, or shared foreign policy, though further integration is a goal for the future. After the readmission of Morocco, the African Union now includes every UN-recognized country in Africa. The parts of Africa not represented in the AU are a few groups of offshore islands controlled by European countries, as well the small Spanish enclaves in North Africa. The breakaway Republic of Somaliland is not a member, but is considered by the AU to be part of member-state Somalia. The North African kingdom of Morocco joined the AU in January 2017, 33 years after withdrawing from an earlier version of the organization. The Central African Republic's suspension was lifted in April 2016. In September 2015, the West African country of Burkina Faso was suspended from the AU after a military coup, but quickly reinstated to active membership when the coup leaders backed down. North Africa's Egypt and West Africa's Guinea Bissau both had their AU suspensions lifted in June 2014, after each held new elections to replace a coup-installed government. The African island country of Madagascar ended its five-year suspension from the AU in January 2014, after a coup-installed military government was replaced with a newly elected president. The North African country of Egypt, one of Africa's largest, was suspended from the AU in July 2013 after a military coup.